These ankle socks are purpose-built for athletic performance, engineered for comfort, and designed to stand out. For every pair purchased, a pair is donated to someone in need. Dimensions (in packaging): 6" x 2" x 0.5"
These are the most comfortable and best fitting socks I have ever owned! After years of trying different types and fabrications from multiplerom multiple manufacturers, I found one manufacturer that does it right. Fits perfectly, wears well without cutting off circulation and launders like a dream. So, why the name Bombas? It’s derived from the Latin word for bumblebee. Inspired by the idea of bees working together to make the hive a better place, the folks at Bombas strive to “Bee Better” and stitch this mantra into every pair of socks they make. 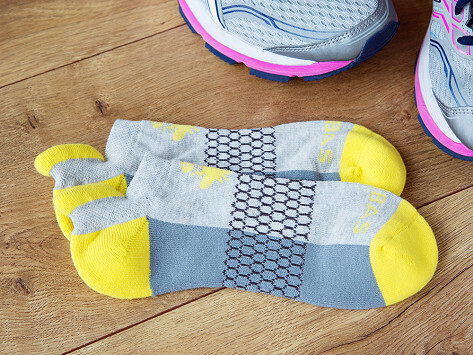 Your socks may be the last things you put on when you’re getting dressed, but Bombas are no after thought.